The Kamehameha Butterfly, Hawai‘i's State Insect, whose host plant is mamaki. 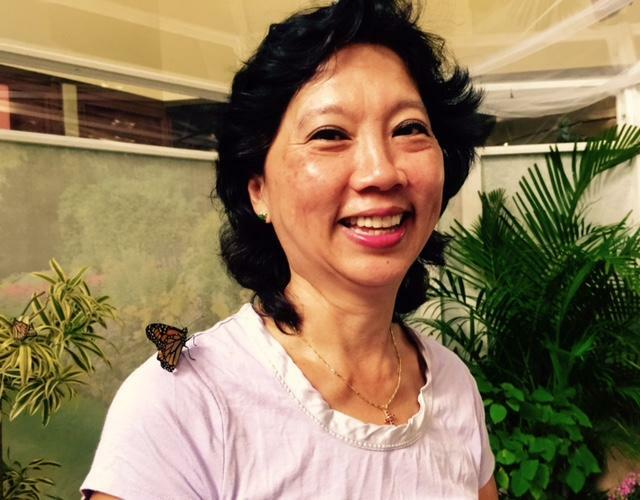 Darlene Loo-McDowell, a butterfly rancher and member of the Hawai‘i Butterfly Society. 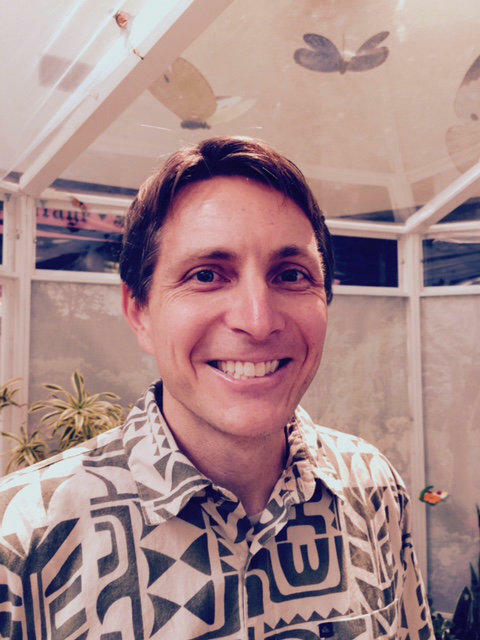 William Haines, specializes in butterflies and moths in the UH Entomology Department. The white flowers are Penta, the other colorful flowers are Kalanchoe, all suitable nectar plants for a butterfly garden. 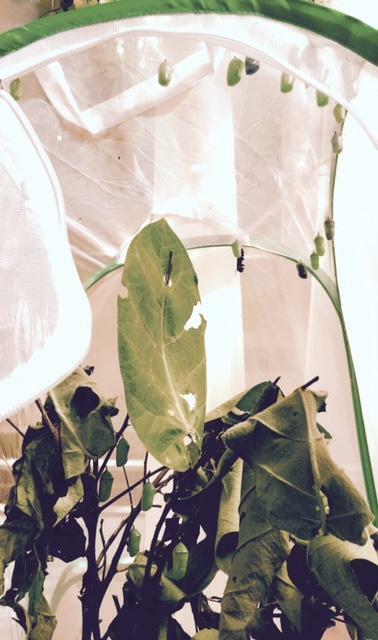 A small "tent" made of netting serves as the butterfly nursery. Note the crownflower leaves inside--they are the favorite host plant of the Monarch butterfly. A conversation about butterflies and how to plant gardens to attract them. Generally, nectar plants like penta, salvia, and kalanchoe attract butterflies, then, each species has a particular host plant on which it will deposit eggs. For the Monarch butterfly, milkweed, or commonly, crown flower, is a favorite breeding site. Loo-McDowell cautions that a couple of trees would be desirable since those caterpillars eat a lot! Mamaki is the most easily cultivated host plant for the Kamehameha butterfly, and is available in garden supply stores. 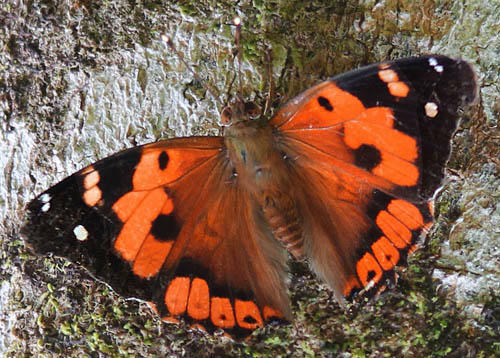 Find out more about the Kamehameha Butterfly Project. The caterpillar "nurseries" can be made any number of ways, but Loo-McDowell uses commercially made net "tents". The Butterfly Society of Hawai‘i has lots of great information including about how to make your own Butterfly Garden. 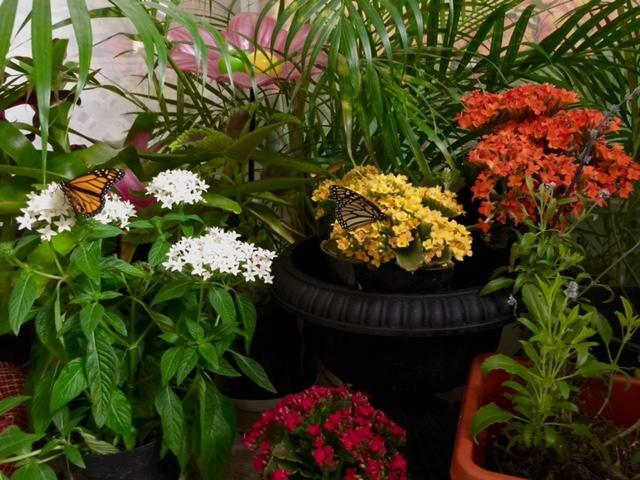 The live “Butterflies” conservatory is on view at Pearlridge downtown through April 4th.